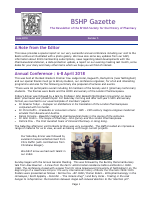 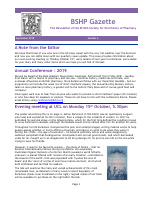 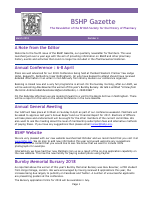 The BSHP Gazette is a new publication for our members, the first issue was produced in May 2017. 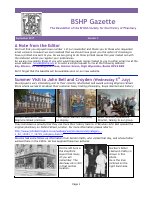 It will include diary dates, society news, RPS Museum updates, general pharmacy history or people news, short communications and feedback. 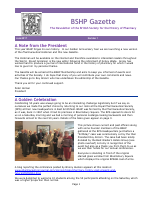 The intention is to produce this as required which is likely to be after each of our committee meetings. 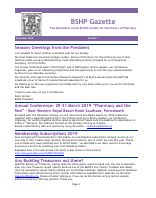 All issues are published on our website and will also be emailed to members who have requested copies. 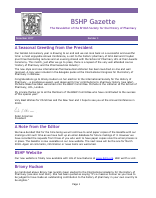 If you would like to submit any item for the Gazette, we would be pleased to hear from you honsec@bshp.org.